The man in black fled across the desert, and the gunslinger followed. With those words, millions of readers were introduced to Stephen King’s Roland, an implacable gunslinger in search of the enigmatic Dark Tower, powering his way through a dangerous land filled with ancient technology and deadly magic. Now, in a comic book personally overseen by King himself, Roland’s past is revealed. Sumptuously drawn by Jae Lee and Richard Isanove, adapted by long-time Stephen King expert Robin Furth (author of Stephen King’s The Dark Tower: A Concordance) and scripted by New York Times Best-seller Peter David, this series delves deep into Roland’s origins. 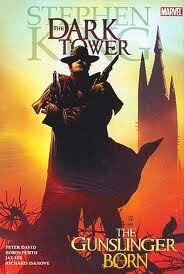 I’ve read the first novel in The Dark Tower series and it must have been all the way back in 2007 because I remember seeing the cover for the graphic novel after I finished reading it and wondering to myself if perhaps I’d enjoy that more. I pretty much grew up on Stephen King when it comes to my reading background, but I have not read much of his work in several years. Either I overdosed or needed to expand or both, but I was looking forward to his Dark Tower series. I was disappointed with Dark Tower which was upsetting, but I did have high expectations. Since reading The Gunslinger Born I am considering going back and trying the series out again because the story is an intriguing one. I realise that The Gunslinger Born is Roland’s background (the main character in the Dark Tower series) and it may put a different light on the reading second time around. Even though the story does have an element of intrigue, with the mix of western meets dark fantasy being very appealing, it wasn’t the story that won me over. It was the art. I absolutely love the artwork in this graphic novel. I’d put posters of that on my wall and would even consider buying the graphic novel for the art alone. The reason the art was a winning factor instead of the story was because the story felt disjointed to me (I swear sometimes I shouldn’t bother with graphic novels and comics). When I get really tired my brain freaks out and I can lose my way quite a bit, but my brain wasn’t that tired when I was reading it. The story eventually came together and I did know what was going on, but it didn’t feel like it read flowingly. I also didn’t appreciate how the narrator would give you titbits to what was going to happen in order to prepare you for action or travesties or whatever else was coming along. Otherwise I enjoyed it and I did give it a fair rating, mostly because of the art. I will be reading the rest of the series as well at some point.